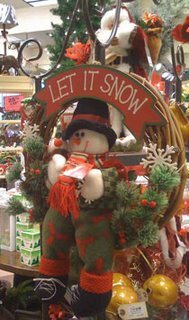 Neale Donald Walsch, author of the best-selling series ‘Conversations with God,’ recently posted a personal Christmas essay on the spiritual Web site Beliefnet.com that was nearly identical to a 10-year-old article originally published by a little-known writer in a spiritual magazine. He now says he made a mistake in believing the story was something that had actually happened to him. With best wishes to all our friends in New England, the Midwest, and the Pacific Northwest. Stay safe, happy, and warm. October is National Breast Cancer Awareness Month. Check out this site for all kinds of information about breast cancer and how you can help in the fight against this disease. Last Friday, while visiting a friend in Connecticut, I walked into a grocery store and there they were: stacks of boxes of Hydrox cookies! Even as a child I preferred Hydrox to the cloyingly sweet Oreo. The Hydrox chocolate wafers were not very sweet, and biting into a Hydrox produced a subtle but distinct contrast between the not-very-sweet cookies and the sweeter (but not nearly so overwhelmingly sweet as Oreo) creme filling. Oreos, and other products like them, have contributed to Americans' desire for overwhelming sweetness in everything: cookies, cereals, fruit drinks, even toothpaste and over-the-counter medications. 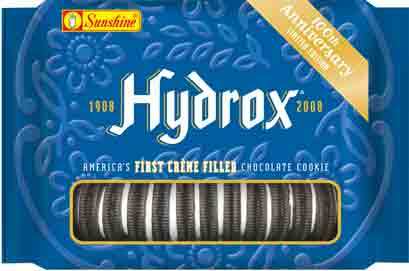 But for the more discerning palate, Hydrox cookies are back, at least for a little while. Kellogg Company has reissued them for a limited run in honor of their 100th anniversary. Hydrox cookies were introduced as the first creme-filled chocolate sandwich cookie in 1908 by Loose-Wiles Biscuit Company, which later became Sunshine Biscuit Company. Looking for a name that went well with sunshine, the company combined the beginnings of hydrogen and oxygen, the components of water with its connotations of purity and cleanliness. In 1996 Keebler purchased Sunshine Biscuit Company and renamed the cookies Hydrox Ddroxies. In 1999 Keebler reformulated the cookies and called them must Droxies. In 2003 the company stopped making the cookies but, in response to public demand, has brought back Hydrox for a limited time in honor of its 100th anniversary. And in the meantime, get to your local grocery store. When they're gone, they're gone for good. As I Turn 60. . . Happy birthday to me! Sixty years ago today, I was born--on the first day of a heat wave, as my mother delights in pointing out nearly every year. (1) True friends are rare and special, and I should cherish each one. (2) Contrary to the American myth, you cannot be whatever you want. I will never be an artist. Although I've done some drop-dead gorgeous needlework in my time, I cannot draw a lick. But I have learned to look for my strengths and then maximize them. (3) We are not all created equal. Some people can draw. I can't. I've learned to live with this shortcoming. (4) No matter how good I am at something, there's always someone else who's better. I've learned to live with this, too. (5) Freud may have been wrong about infant sexuality, but he was dead on about our psychological defense mechanisms. (6) You cannot have it all. You would not want to: You'd be overwhelmed. Figure out what's important to you, then go after it with zeal and passion. (7) There are always as many sides to every story as there are participants. (8) You cannot overcome every obstacle in life by sheer willpower. Learn how to figure out what help you need. Then learn to ask for that help. When you refuse to ask for help, you deny someone else the opportunity to be helpful. (9) We are what we do. Actions speak louder than words. We demonstrate our true character through our behavior. Try to perform more good than bad actions. (10) When I find a rut I like, it dig in deep and stay put as long as possible. Such routines are comforting, but change will occur whether we want it to or not. In fact, the more we want things not to change, the more they probably will. I try to view these occurrences as opportunities and embrace them. (11) The world is a big place, and it can sometimes be scary. But you have to be willing to put yourself out there [apologies to Dr. Phil], to meet new people and try new things. (12) However, it's also OK to enjoy being alone. What's important is to find a balance that's comfortable for you. (13) "If you want something done right, do it yourself" is not always good advice. Learn to delegate. Then learn to be happy with "good enough." Perfectionism causes ulcers and high anxiety. (14) Love and friendship are never wasted. Even when formerly good relationships go south, having experienced the good times is priceless [apologies to MasterCard]. (15) Say "I love you" to the people you care about. Say it out loud and say it often. (16) Despite the lack of visible welts or scars, verbal and emotional abuse of children cuts just as deeply as physical abuse and should be equally condemned. (17) Once you begin to look for meaning, synchronicity will occur. (18) Trust your gut. Every time I've ignored my intuition, I've regretted it. (19) What you send forth into the Universe is what the Universe will ultimately give back to you. (20) Embrace life's mysteries. Expect to be surprised. 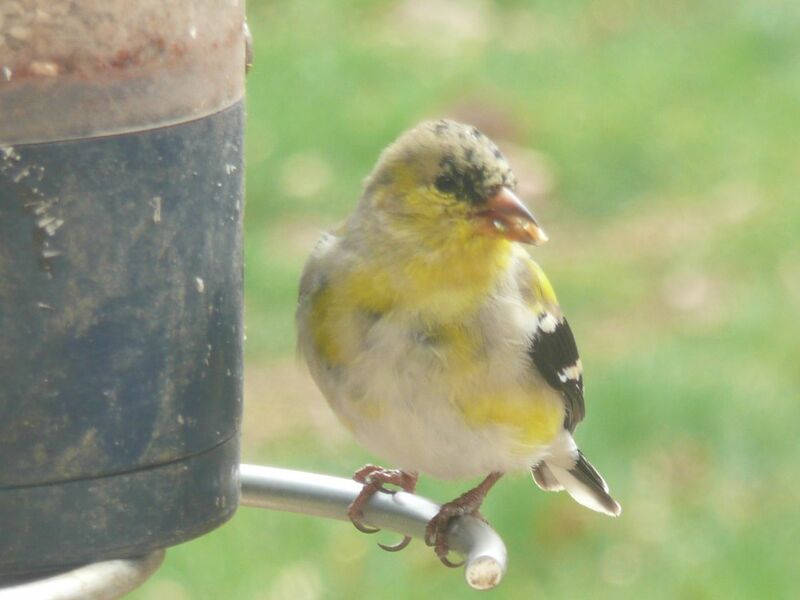 Even more than the blooming crocus, the regoldening goldfinches always mean spring to me. 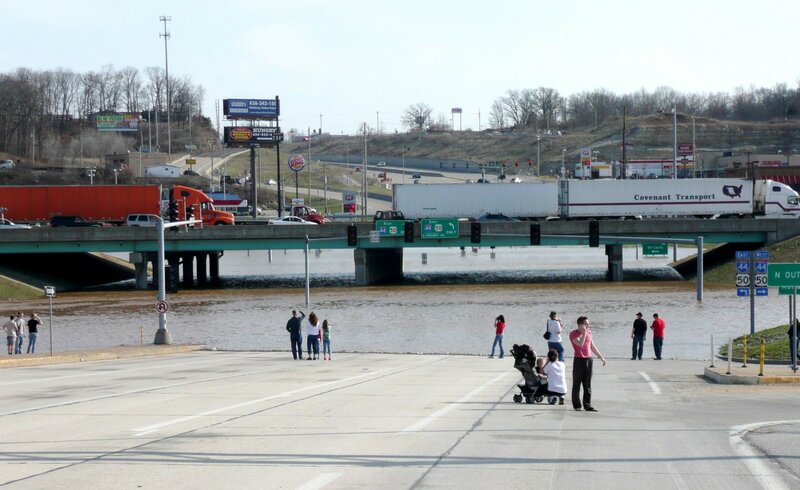 This was the scene yesterday (Friday, March 21, 2008) near Valley Park in St. Louis County, Missouri, where MO Hwy 141 intersects with Interstate 44. The photo was taken looking south down 141. The vehicles on the overpass are on I 44, which was reduced to one lane heading west. The Missouri Dept. of Transportation (MoDOT) placed concrete barriers and sandbags (which would be just off this photo to the right) along the northern edge of I 44 west to try to keep the rising water from the Meramec River off the road. The water you see here is not the river itself; that's about a half mile north of the vantage point of this photo. There's a levee protecting the downtown area of Valley Park along the northern edge of the Meramec. This water is from farther west, where there is no levee. When this photo was taken, the river was at about 34 feet. Flood stage in Valley Park is 16 feet. The Meramec is expected to crest at about 39 feet in Valley Park this afternoon. The previous high-water mark in Valley Park is 39.7 feet, which occurred in December 1982. The new levee was built to help prevent massive flooding such as occurred here in 1982. Yesterday the temperature here was 72 degrees. Since the public schools were on spring break, there were a lot of kids in the crowd that came to flood watch. Many of the younger kids were more excited about getting to walk in the middle of the road than they were about viewing the power of Mother Nature. You can see a lot more photos of the flooding here. As quickly as the flood waters rose, they have receded. This morning Hwy 141 was open in both directions. Overnight MoDOT crews used their snow plows to push the mud off the road. Over the next few nights they will remove the concrete barriers and sandbags from along I 44. The Meramec River crested a little lower than expected. The water never did reach I 44. And Valley Park's new $49 million levee held. The towns further west, though--Eureka and Pacific--experienced bad flooding.